These easy and delicious fish recipes are sure to make you the talk of the dinner table. 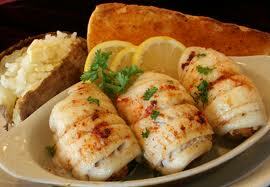 These are some of my personal favorite fish recipes with some extra dishes added in. I will frequently update this hub with more of my favorite fish recipes so be sure to check in every now and then to see whats new. If you have any recipe suggestions (pertaining to fish), then please let me know in the comment box below. I will be more than happy to help. I hope you enjoy. Combine salt, pepper and thyme in a small bowl, then rub the mixture on all sides of the salmon. Melt the butter in a baking dish and then add the salmon and coat it with the butter. Add your light cream, onion slices, parsley, garlic, and bay leaf to the baking dish and arrange the cucumber strips around the fish. Bake covered for 40 minutes or until the center bone can be removed easily. Remove and discard the bay leaf, onion, parsley and garlic before serving. The flavor is all you want. Serves 4 to 6. Preheat your oven to 350 degrees. 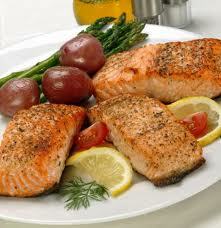 Place salmon steaks in a greased baking pan. 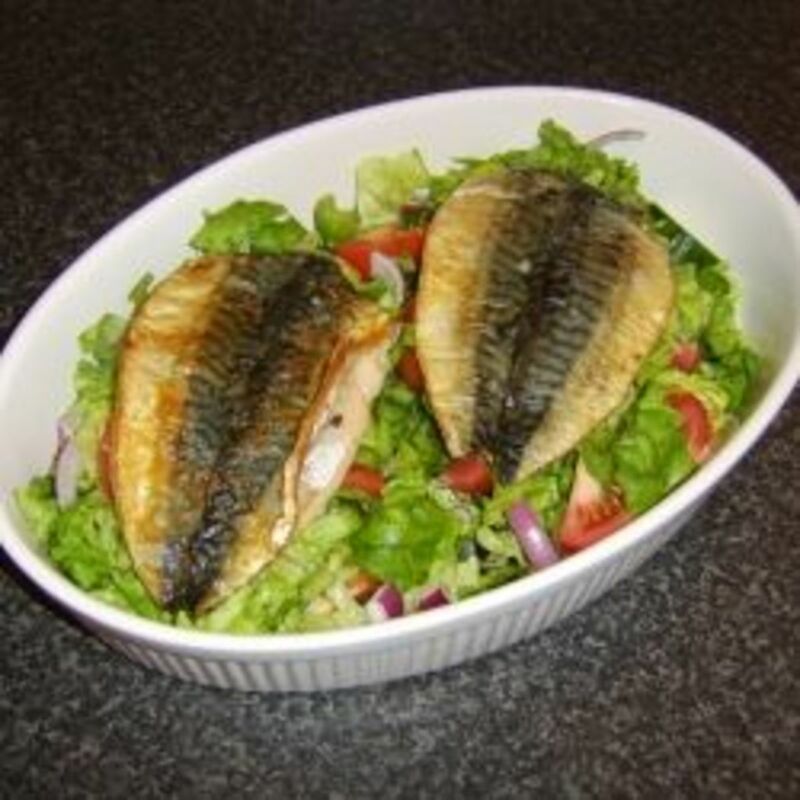 Add melted butter, salt, paprika, one tablespoon of grated onion and Worcestershire sauce in a small bowl and spread this mixture over the fish. Sprinkle the remaining one tablespoon of grated onion over each steak. Bake for 25 to 30 minutes. Serves 6 to 8. Preheat your oven to 400 degrees . Wash your potatoes and rub the oleo all over them. Poke holes in them with a fork. Place potatoes in preheated oven for 1 1/2 hrs. or until tender. Combine your tuna, onion, parsley, cheese soup, paprika, Tabasco sauce and salt in a small bowl. Mix with a fork to break up the tuna and blend it well. Cut a small (about 1 inch) slice off the top of each potato. Scoop out the inside of potatoes, leaving just the shell. 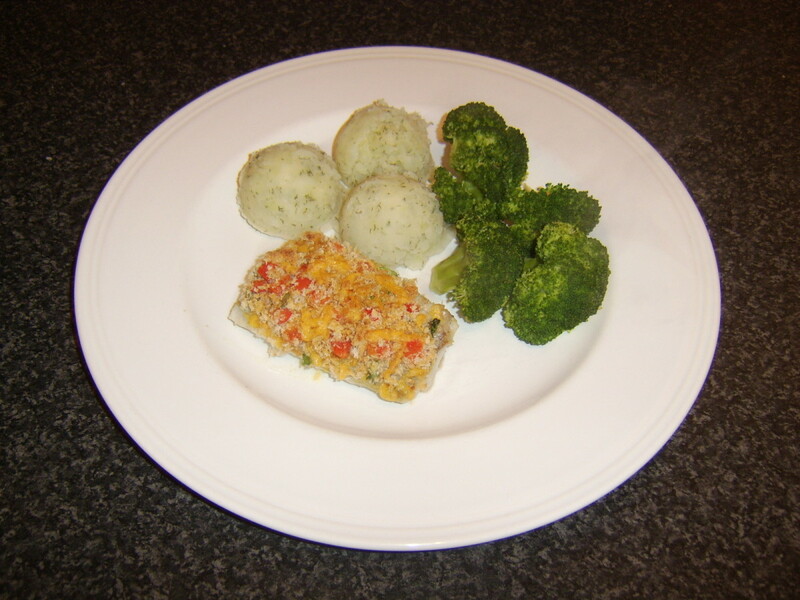 Add the scoops of potatoes to your tuna mixture and mix well. Spoon the mixture lightly into your potato shells (enough to create a mound). 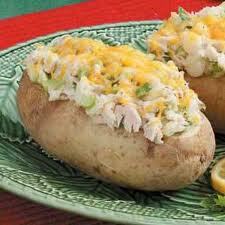 Top each potato with a 1/2 slice of cheese. Return to oven until cheese melts. Serves 8. 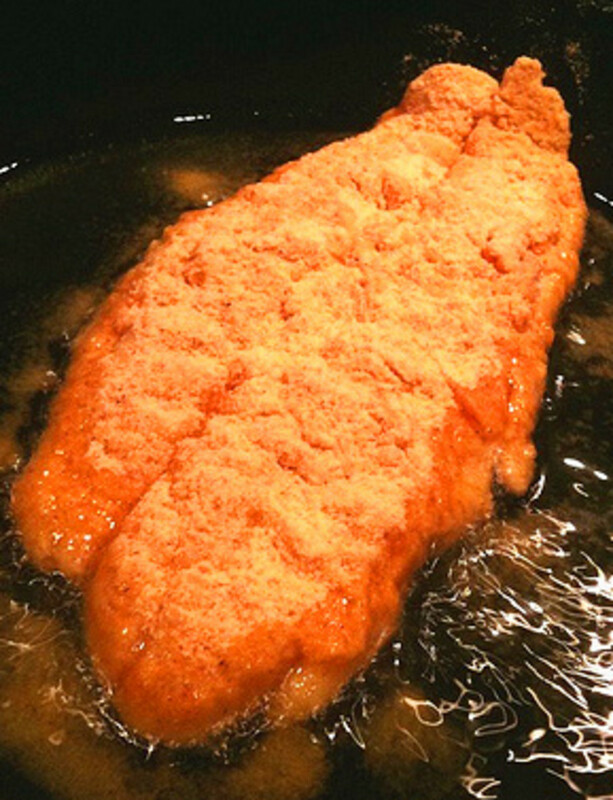 Place your fish fillets in a single layer on a greased, oven-to-table type broiler pan. Brush your fillets with lemon juice. Combine Parmesan, butter, mayo, green onions, salt and the hot sauce of your choice in a small bowl and set it aside. I prefer Red Dot Louisiana hot sauce. Broil the fillets for 6 to 8 minutes or until they flake easily. You will be able to tell with a fork. 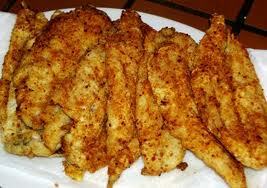 Remove your fish from the oven and spread on the cheese mixture. Broil for another minute or so, or until the cheese is lightly browned and bubbly. Garnish with lemon twists and parsley for style. Serves 2 to 4. Combine paprika, sage, cumin, garlic powder, sugar, salt, cayenne and onion powder in a large freezer bag. Close the bag and shake until the seasonings are well blended. Put 1 fillet in the bag at a time and shake until lightly coated. 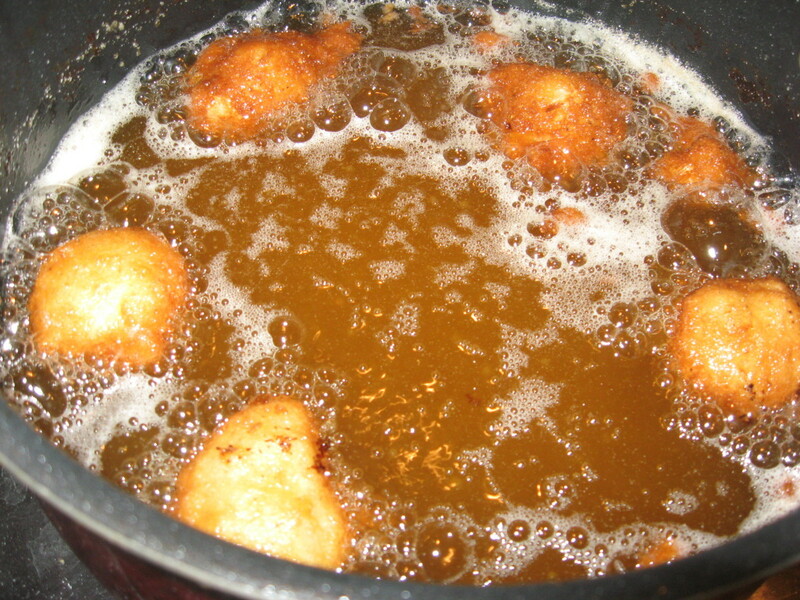 Grease a large, non-stick skillet with oil or cooking spray. Add about 3 tablespoons of oil and heat over medium-low heat until hot. 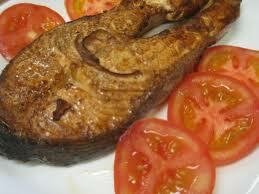 Add your catfish fillets, with the skinned side up and cook for 4 to 5 minutes or until lightly blackened. Carefully flip the fillets with a spatula. Cook 4 to 5 minutes longer or until fish feels firm and dark on the thickest part. 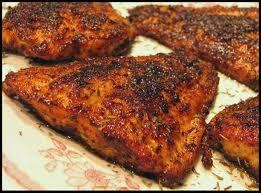 Slice your lemons and serve the slices with your blackened catfish. Preheat your oven to 350 degrees. In a large skillet (about 10 inches), melt the margarine and remove 1 tablespoon and set it aside. Heat the remaining margarine until it becomes bubbly and hot. Next, add the scallions and green peppers to the skillet and sauté over medium heat until vegetables are soft. This will take about 3 to 4 minutes. Remove skillet from heat and let it cool slightly. Now, add the bread crumbs, egg, 1/4 cup parsley, salt, nutmeg and red pepper to the vegetables and mix well. Spoon 1/4 of the vegetable mixture over each fillet and roll them up. They should stay closed however, if they don't, use toothpicks to secure them. Place your stuffed fillets,closed end down, to a greased, 8 x 8 x 2 baking pan and spoon any remaining ingredients over them. 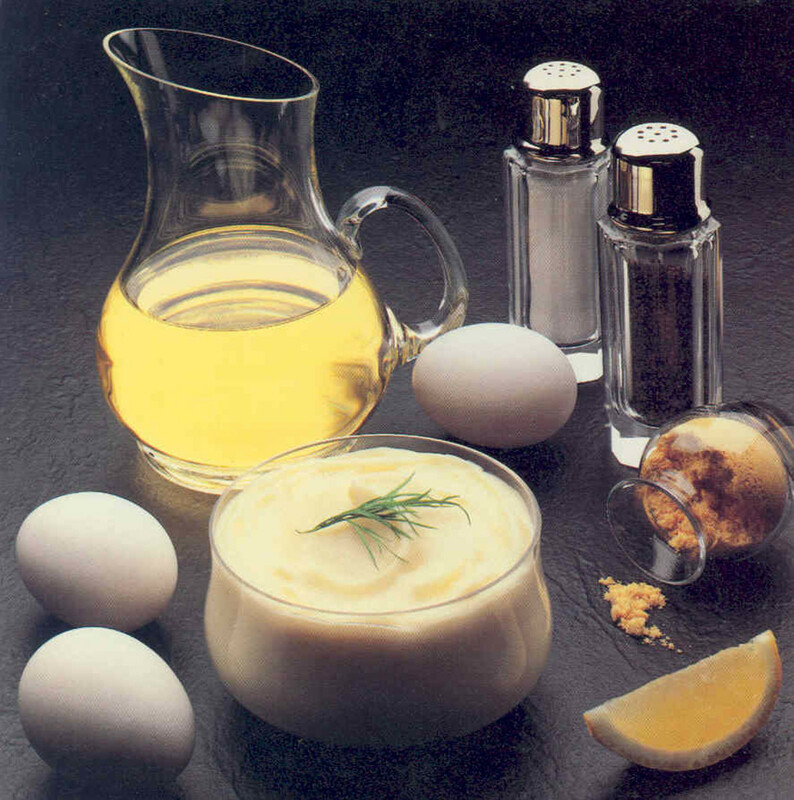 Drizzle your reserved margarine over the fillets and sprinkle each one with 1/2 tablespoon of lemon juice. Bake for 15 to 20 minutes or until the fish easily flakes. You will be able to tell with a fork. 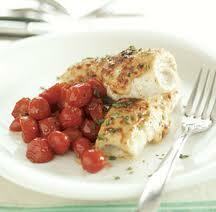 Sprinkle your rolled fillets with the remaining parsley and serve. Serves 4 to 6. 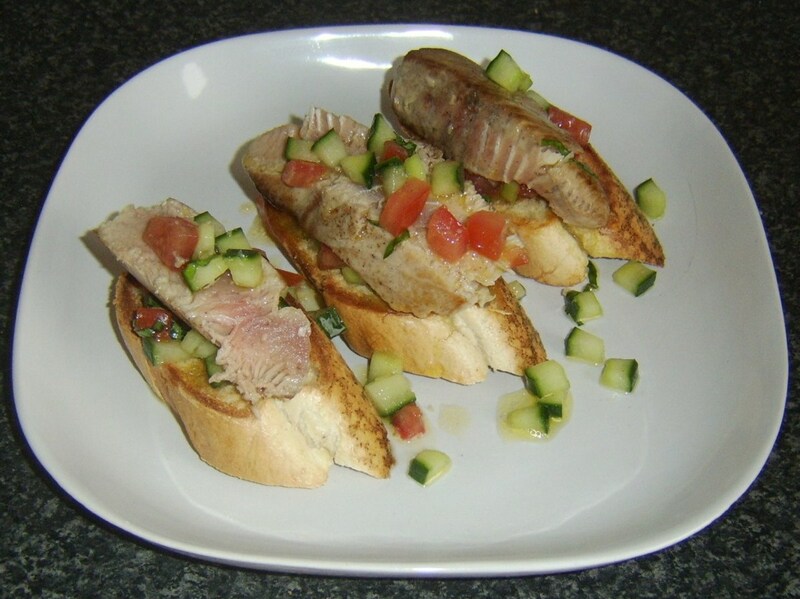 Combine tuna, olives, green onions and celery in medium sized bowl and set aside. Combine picante sauce, sour cream and cumin in a separate bowl and mix well. Pour the picante sauce mixture over the tuna mixture and mix lightly (toss like you would a salad). 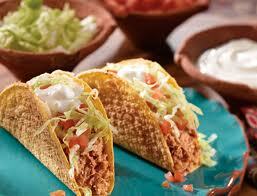 Line your taco shells with lettuce and spoon the tuna mixture into the shells. Or line individual plates with tortilla chips and top with tuna mixture. Put about a half handful of shredded lettuce over the tuna mixture and drizzle on some more Picante Sauce. Top with sour cream, if desired and serve. Great recipes especially the blackened recipe. Gonna have to try this one for sure! Im glad you enjoyed this hub. Thank you for your compliments and for taking the time to comment. Very much appreciated. Thank u very much. glade u enjoyed. Wonderful recipes.....i love to eat..looking forward to more recipes. Wonderful recipes! Thanks for sharing them. Love them all. Thank you breakfastpop and I'm glad you enjoyed these delicious fish recipes. I like to add a little extra picante sauce to give the tuna that extra kick. I hope you enjoy. Thank you so much for these wonderful recipes. I am going to try the Tuna tonight.